At this month's Dinner in the Dark, "R" and I met Anna from Good To Go Cafe. 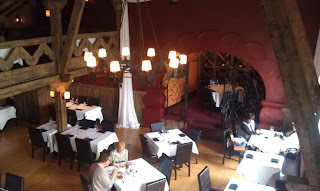 We have a mutual friend, and I had heard wonderful things about her small cafe in downtown Cleveland...so I was excited to meet her in person (over cocktails after the event), and even more excited to dine with her the following day. We already had plans to grab lunch in downtown Cleveland that day, so it was an easy switch to stop in Good To Go instead. I'm so glad that we did! She stuffed us to the gills, and I almost had to roll out of there. 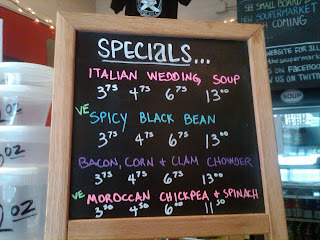 We couldn't resist one of the specials that day, Turkey Pineapple Chili. This was seriously one of the best chili dishes that I've ever had. The subtle balance of heat from the spices and sweet from the pineapple just played on our tongues, and I couldn't stop eating it. And I know chili, because my father makes one mean homemade chili. I finished the entire cup, even knowing that we had more food coming. Next up was the real draw that brought us in that day...leftover Sweet Potato Gnocchi with Braised Duck Ragout from the event the night before. Anna had prepared the gnocchi, so she was serving up this hearty, flavorful dish the next day as a special. We lucked out- this dish was a crowd favorite at Dinner in the Dark. The cafe was easy to find, since we knew that it was located inside of the IMG building off of East 9th. 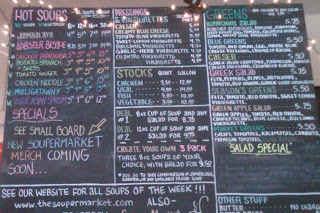 It is just inside the lobby, and the cute chalkboard sign steers you in the right direction once you enter. We dined in, and watched as Anna greeted all of her customers as if they were family. She wished each of them a "5 Star Day", and honestly I left there feeling like I was going to have one after enjoying our lunch so much. Long story short, Anna is offering delicious, and easy grab-and-go, breakfast and lunch options. You'll find an assortment of fresh salads, wraps, sandwiches, soups, treats, specials and more for lunch. Follow her on Twitter (@good2gocafe) for specials and a 20% off code each day. The code of the day was BiteBuff that day- isn't she sweet! You can also pre-order online for a quick pick up. Go check it out, and tell Anna that I sent you! The Great Big Home and Garden Expo approached me about hosting a ticket giveaway for two general admission tickets to one reader for the day of their choice. The third annual expo runs from Saturday, February 4th - Sunday, February 12th at the IX Center. More than 650 exhibitors will be in attendance, showcasing their techniques in cooking, gardening, home improvement and more. A couple of my favorite chefs are listed there, so my interest was peaked. Also, "R" and I have constantly been involved with home improvement projects since I moved in four years ago. Can you say "bachelor pad"? We've come a long way, but there is always more that I want to do. I can't wait to check out the expo for the first time, and you should too! One lucky reader will for free, so just leave me a comment on this post telling me which culinary-related demo you'd be most interested in. I'll select a winner, using random.org, on Friday, January 27th. You can also receive a second entry for tweeting "I want to attend the Great Big Home and Garden Expo for free, courtesy of @BiteBuff at http://tinyurl.com/89ac8zj." Make sure that you leave a second comment on this post for any tweets sent. Lastly, all readers can receive a $1 discount by purchasing your tickets online and entering the promo code "BITEBUFF" at check out. You automatically get a $3 discount for ordering online, but this gives you an additional $1 off your general admission ticket- a savings of $4. What home improvement projects have you tackled in your house? Disclosure: I was provided with two general admission tickets for myself and two general admission tickets for one reader in exchange for this post. The opinions stated are 100% my own. Thank you for all of your kind words through blog comments, tweets, and Facebook posts about the new blog design. I'm happy with it, and I think the change came at just the right time. Also, I appreciate all of your suggestions for finding tacos in the area. I've got my work cut out for me! Keep the ideas coming throughout the year- I'm on a taco hunt. Random.org selected...Renee from @BQRC23! Congratulations, you've won three $25 gift certificates to local, independently-owned restaurants. Email me your contact information to claim your prize, and I'll drop them in the mail. Enjoy your free eats! Stay tuned for some new posts this week, including my discovery of Good To Go Cafe in the IMG building downtown. Delicious breakfast and lunch spot with really creative food! It's time to pick a winner for the Near West Theatre benefit tickets.....drum roll please. 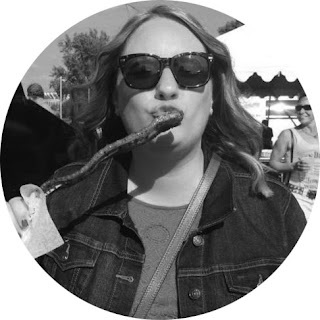 Random.org selected: Amanda from Clue Into Cleveland! Congrats, and I look forward to seeing you there. Email me your mailing address and phone number, and I'll get you taken care of. Thank you to everyone that entered! It's not too late to purchase tickets to enjoy an evening of the arts, and delicious food from Spice Bar + Kitchen, to support a very worthy organization in our community. Now, on to the post for the day. I have been a bad blogger since my surgery (understandable). Over a month ago, Good Greens Bars (out of Shaker Heights) contacted me about reviewing their product for the blog. Normally, I wouldn't review a product such as theirs. But the fact that they are local, and contain 100% of our daily fruits and vegetables requirements, intrigued me. The company generously sent me a box of complimentary bars, including their Wildberry, Chocolate Peanut Butter, and Chocolate Coconut flavors. Over the next two weeks, "R" and I sampled each flavor. They were tasty, slightly soft and chewy, and certainly didn't make us realize that we were eating all of these great things for us. They tasted almost like candy bars, but were helping us get 12 grams of non-GMO soy protein, 5 grams of fiber, 40 antioxidants, and 3 probiotics. The Chocolate Coconut was my favorite- reminding me of a flat Mounds bar, and the Wildberry was "R's" pick. Their secret is the Z52 Super Powder, which give the bars 52 superfoods and all of its nutrients. The bars are also low glycemic, vegan and gluten-free. They use all natural ingredients, proven to boost your energy, lower cholesterol, improve digestion, strengthen your immunity, and help increase brain power. All this packed into a yummy bar? Sign me up. You can find them at Heinen's, Marc's, Mustard Seed Market, Dave's, Anderson's Market, GNC and Krieger's. I suggest checking them out. They made a great grab-and-go snack. Disclosure: I received the above pictured bars to sample and review in exchange for this post. The opinions stated are 100% my own. Thank you to Good Greens for the opportunity to share their product. It's still hard to believe that it is January...2012...a new year. Where does the time go? The blog will turn 4 in just a few short months. I can't even begin to count all of the wonderful things that blogging has brought to my life, and I have a feeling that this year will be even better. But two things that it has brought me were both mashed together last Friday night as I attended Alexa and Lisa's New Year's Eve Eve HollaDays party at, the not even open yet, Spice Bar + Kitchen in the Gordon Square Arts district. First, some fabulous friends that I never would have met if it weren't for social media, and secondly, a heightened awareness of the happenings in Cleveland. Not only did I get to enjoy a night out with a great group of people, but I was also able to check out Spice's new space before it's even open to the public. Let me just say...we're in for another fantastic dining hot spot in Cleveland. The space is looking gorgeous with exposed brick, muted colors, warm woods, and just enough of an "industrial" feel to leave me wanting more. I also received a sneak peek at their first menu recently, and it seems well-balanced and focused, while maintaining their commitment to staying local and seasonal. So, all this chattering about Spice Bar + Kitchen is really leading me to today's post. They have partnered with Euro USA to provide the food for Near West Theatre's Annual Benefit on Saturday, January 28th. This is only 18 short days after Spice's expected opening, so it's a great chance to check them out while supporting a worthy local organization. "Consider Yourself One of Us!" will provide a night of performances by Near West cast members, food and drink, desserts provided by Gypsy Bean & Baking Co., dancing and a live DJ, and a fantastic silent auction and raffle. 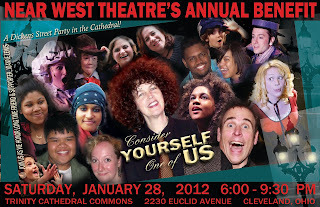 Tickets are $85 (or a 10-pack for $800), and you can purchase them by calling 216-961-6391 or at www.nearwesttheatre.org/benefit. It is being held from 6-9:30PM at Trinity Cathedral in Downtown Cleveland. Or, you can win two tickets here! I have generously been provided two tickets for myself, and two tickets to give away to one lucky reader. Come join me for a night of enjoying the arts, and checking out Spice Bar + Kitchen. The after-party is being hosted in their new space on Detroit Avenue, with cash bar/food and live music from The Luckey Ones. Simply leave a comment on this post expressing your interest in winning, and I will drawn a winner this Monday using random.org. You can also receive a second entry for tweeting "I want to win tickets to the Near West Theatre benefit from @BiteBuff at http://tinyurl.com/7436gg4". Make sure that you leave a second comment on this post if you tweet. So come enjoy an evening with Near West, myself, and Spice Bar + Kitchen. Good luck! Disclosure: Near West Theatre provided me with two complimentary tickets to the benefit, and two tickets to give away to one reader in exchange for this post. However, I fully support this local organization and the opinions stated are 100% my own. 2012- The "Year of Fun"
My wish for 2012 is simple...Health and Happiness. This may sound broad, but all of my smaller goals fit into these two categories. Both are things that I did not have very much of in 2011. So, I have officially dubbed this year as the "Year of Fun", and my wish is to get past this health issue that I've been battling and to introduce more happiness into my life. I have an amazing family, boyfriend, friends, and city that I live in...so I have a feeling that achieving the "Year of Fun" will be pretty easy. As usual, the new year also brings a new Top 10 "To Dine" list as my New Year's resolution (click to see 2010 and 2011 lists). This year, I had you submit the restaurant suggestions. I was looking for places that, simply put, are wonderful spots to dine at but yet don't get the wide-spread recognition that they should. You all sent in some great choices, and it was hard to narrow it down to just 10. By the way, you love your Italian food! But...here is my final 2012 Top 10 list. Each year, I challenge myself to dine at 10 specific restaurants and I'm really looking forward to the 2012 list. Of course, I also have a few spots in mind that didn't make the list, such as: Ginko, Crop, Pura Vida, SOHO, Fountain, and Hodge's. 2012 is already shaping up to be a great year for dining, blogging, and fun! Thank you again to everyone that submitted restaurant suggestions. I think the end result is just what I was looking for. Cheers to 2012 and the "Year of Fun", and I hope that this year brings you everything that you wish for. Thank you for continuing to stick with me, and I think you'll love what 2012 is bringing to the blog.